GetData Software Development Company has offered Recover My Files data recovery software which is simple and easy to use and very effective as well. You can be fortunate to avail proficient support provided by this software if you choose it. The files can be searched by their names as well as extension and keyword with the help of Recover My Files data recovery program. The file contents are searched first to differentiate file extension like JPEG or jpeg. There is support available for RAID drives as well. 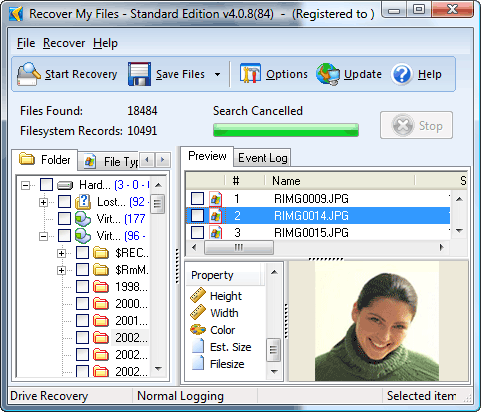 Safe Recovery and Full file preview are the standout features of this data recovery software. Recover My Files provides the best and largest feature set. The users can recover data from compressed and encrypted files, videos, photos, and deleted emails. The data can also be retrieved from zip drives, camera cards, USB drives, iPods and floppy discs. This software can recover files which deleted from recycle bin and from formatted hard disk as well. It can retrieve files which are lost due to virus attacks or power failure. The RAID drives can also be added to scanning process and this feature is not available in previous versions. This software can help you to recover data from accidental formatted hard disks. You can also reinstall Windows, and make correction in the missing drive letter. There is option for the users to choose recovery of files automatically or you can pick files from list in order to perform scanning. There will be no problem for the users in using Recover My Files software. There will be message saying “Recover a Drive” or “Recover Files” on opening this program. The step by step wizard will guide when you click any one in order to complete a particular process. There will be thorough explanation of whole thing and there will be no confusion for new users. All files were recovered by Recover My Files during the test. This software is easy and simple to use and very effective as well. You can be able to recover your lost files which are deleted many days or weeks ago. There will be no problem in locating these files for this software. The files can be searched through their names, size, date and keyword with the help of this data recovery program. Both types of searches available in this software with two different search options that are to retrieve files automatically or recover files from list of file types. There is well established help offered by GetData software. The users can access email support and can also get help from FAQs section. All the questioned will be answered so that you can be able to get help completely to recover your lost data and files. There is telephone support available as well in Australia and sales support on phone for the users in US. There will be no panic for users in using this software and they will recover their lost files very easily. There is free files detection download available for the users with the help of which all data can be recovered easily with loss of anything. You will certainly find this program effective.